In a bowl mix together the boiling water and orange jello. Once the jello is dissolved add in the cup of cold water and mix. Place the fruit into <g class="gr_ gr_261 gr-alert gr_gramm gr_run_anim Grammar only-ins replaceWithoutSep" id="261" data-gr-id="261">desired</g> container for jello salad. Pour the jello mixture over the fruit and refrigerate until solid. 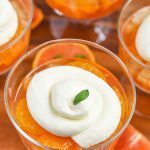 When your mandarin orange jello salad recipe is done start working on the whipped topping. In a stand mixer or with a hand mixer start whisking the heavy cream, milk and pudding packet until it forms a whipped cream. Pipe the whipped cream pudding onto the jello salad and serve.